I came running to post at thread about this, but you guys are fast! I suspect this has been in the works for a LOOOOONG time. Now we can have an AG who is not recused, who will go after the Deep State. Aquarius, Capnron, FlyoverCountry, KOMMA, Librarian, Lily, Moon Rocks, Pope Trollalotta, Seeker22, WhiteAngel likes this! Wowzers! It did not take long after the midterms for Sessions to clock out. Its beautiful that he resigned which means POTUS can appoint someone who will get the work done. , BadBrad, Debauchery, KOMMA, Librarian, Moon Rocks, oldcynic, Pope Trollalotta, sybdragon, WhiteAngel, WNC likes this! Damn! I wonder if something big is about to go down. Kraut the Rebel, Librarian, Lily, Moon Rocks, MysticPizza, phxsparks, sybdragon, TheCoffeeFairy, WhiteAngel, WNC likes this! Moon Rocks, WhiteAngel, WNC likes this! %#jack, BadBrad, bigD111, Pope Trollalotta, Talon, WhiteAngel, WNC likes this! Let's hope we end up with an AG with huge brass ones and a hatred for the Bush/ Clinton cabal. It doesn't break my heart to see the elf faced no balls dwarf Sessions walking out the door. At least now granny doesn't have to be worried about a bust at her weed dispensary. Angry Red Man, BadBrad, bigD111, HomeLessPatriot, Kraut the Rebel, Moon Rocks, MysticPizza, phxsparks, SouthernBelle, Talon likes this! Remember Harry Reid and Obamacare? These guys still have power until the end of the year. 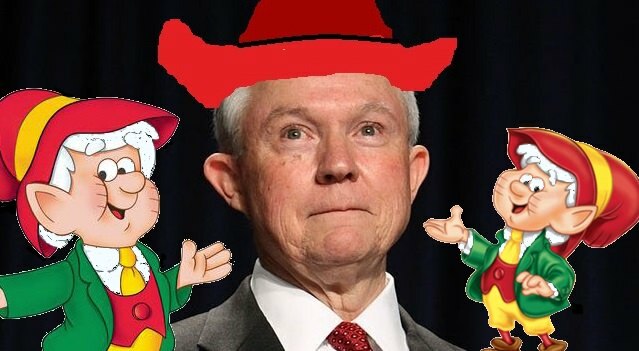 And the Keebler Elf makes his exit. %#jack, bigD111, HomeLessPatriot, WhiteAngel likes this! So what of the theory Sessions was working incognito, not revealing what he is doing about busting the cabal. Have faith? Don't doubt Sessions? Wasn't that a "Q" stance? , Aquarius, bigD111, Librarian, Moon Rocks, Pope Trollalotta, sybdragon, WhiteAngel likes this!